(Newser) – Sufferers of Wilson disease, a rare condition that causes copper to build up in the body, were excited by the announcement of a generic version of the 50-year-old drug they use to treat the condition. Then they heard the price tag: $18,375 for a 100-pill bottle. "I had personally hoped for more of a discount," says Mary Graper at the Wilson Disease Association. The New York Times uses the case of Wilson disease drug Syprine to illustrate the problem of skyrocketing drug prices in the US—and how introducing generic versions of drugs isn't always enough to solve the problem. Valeant Pharmaceuticals International made its name buying old drugs and jacking up their prices. Syprine, which was developed in the 1960s, cost $652 in 2010. By 2015 Valeant was charging $21,267. It's absolutely criminal what these pharmaceutical companies are getting away with. That is exactly why the government should make healthcare universal for all U.S. citizens, so that they and only they, will be able to negotiate (regulate) drug prices. It's quite obvious that healthcare companies have failed miserably in that regards. I wish Anonymous would resurface and publish all of the Pharma company's (and I mean all of them) senior management email addresses, cell phone numbers and home addresses to the public. 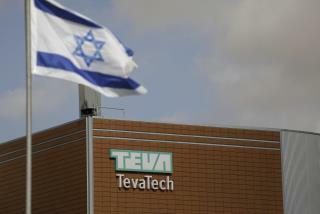 Teva Pharmaceutical, the Comcast of drugs.